Headed into the holiday season, I thought you and your readers might be interested to know about a campaign to help children and families in need. Sharecare, an online health and wellness platform co-founded by Dr. Oz, is supporting the Ronald McDonald House Charities® by donating to help continue care given to families and children battling illnesses. I saw on your “Be a Part of Project Advent!” post that you are a strong supporter of this foundation, so I thought you might enjoy another chance to help. Sharecare will guarantee a $5,000 donation, but they are also conducting a Facebook campaign to reach 100K fans by December 31. If they reach that goal, Sharecare will double the donation to $10,000! We would be honored by your support in featuring this initiative on your blog. 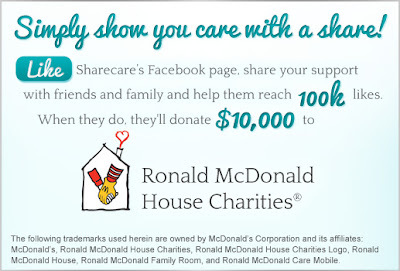 Below are the details, and we also have two banner images available that you can use to link to the Sharecare Facebook fan page: http://www.facebook.com/SharecareNow. There you go! Two ways you can help Ronald McDonald House without even having to stand up from your computer! Take a lil rest. Go ahead, you've earned it. i "liked" them. damn. i'm such a giver.